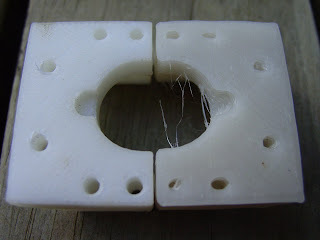 So, how long before you've replaced all the Stratasys parts on your machine with home-built ones? awesome! the printing quality & quantity has certainly been improoved :) keep up the good work up! at the lab we are currently stuck in renovation work. so we'll need some time till we can start with our repstrap. 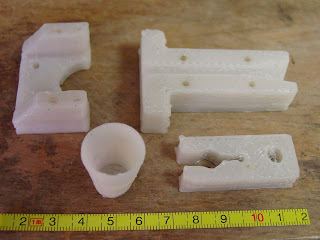 I'm working towards producing all the parts for a Mk2 extruder. If that works, we'll be fairly sure that CAPA is up to the job of building a Darwin. I'm unlikely to replace all the bits of Zaphod, simply because Darwin is a more desirable product. It'll be faster and have a bigger build volume. Once I get the head speed up a bit I can actually draw finer detail too. Great job, Vik! 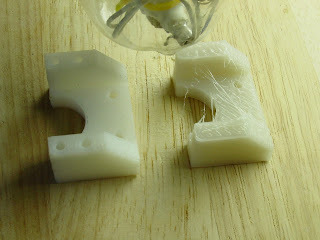 Making a Mk 2.2 is my first priority when I get Tommelise printing properly, too. Give me about another month, I think. yeah, definitely dont REPLACE parts... you got a working machine, instead... i suggest building a NEW machine with the parts you print out.